The periodic table is an ordered composition of chemical elements sorted by atomic number, electron formation, and chemical properties. This digital presentation will show you the core of chemistry. The user interface of this digital periodic table is straight and clean. 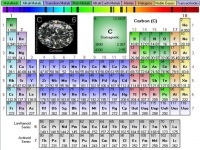 Just by hovering the mouse pointer on each elements, you will show information about the element including the image and isotope structure number. On the top of the interface, there are more tabs representing variation of tools that help find more information relating to periodic table. The graph tab brings the data page for the elements. The search tab helps seek through all elements with advanced search method. There is also atomic tab that you can see the animation or visual representation of electron structure of every element. And finally in the Images tab, you can find pictures of all elements. Fun educational game for children aged 3-6. Playing to memorize multiplication tables for children.